Wind energy is now in the forefront of national energy policy, both politically and in research funding opportunities. It is the only renewable energy source that is cost competitive with traditional sources like gas, coal, oil, and nuclear. As a result, over the past decade wind has become the fastest growing energy source in the world. Installed capacity in the U.S. has increased from 2.5 GW in 2000 to more than 60 GW by the end of 2012. Despite these gains, significant advances are essential to achieving the national goal of generating 20% of the total electricity from wind by 2030 (U.S. Department of Energy, 2008). Unlike in Europe, U.S. wind generation currently comes exclusively from onshore resources, despite the fact that offshore wind energy offers large continuous areas suitable for major installations, proximity to major load centers, higher quality winds and wind speeds, and lower turbulence. The National Renewable Energy Laboratory (NREL) estimates that winds offshore of the United States within 50 nautical miles of the coast have the potential to generate an average power of approximately 1,000 GW (Musial, 2007). The U.S. Department of Energy estimated that peak demand on the nation's electric grid will reach 786 GW in summer 2013 (U.S. Energy Information Administration). The offshore wind resource is also located near major population centers, including the Northeast, the Gulf coast, the Great Lakes, and the West coast. Wind energy technology has advanced significantly over the last thirty years, to the point where it is often cost competitive with electricity from conventional sources. The cost of energy from land based wind turbines has dropped from about $0.50/kWh in the 1970’s to approximately 1/10th that today, depending on site conditions (Wiser & Bolinger, 2008). With less than 3.5% of the electricity in the U.S. generated by wind energy and no offshore wind farms in operation, there remains tremendous opportunity for growth. While wind energy technology has advanced significantly, and onshore wind energy is approaching a state of maturity, offshore wind energy presents an extremely complex technical challenge. New scientific knowledge and technology advancement are much needed for offshore wind energy systems, to increase rotor efficiency, improve turbine reliability, and reduce system costs (U.S. Department of Energy, 2008). The transformative research proposed here will significantly impact offshore wind energy technology, and will result in more efficient, reliable, and cost effective wind energy systems. Four specific research topics are presented, ranging from the wind resource itself, to the turbine, the support structure, and the overall wind farm configuration. This range of topics reflects our systems level view of wind energy. Moreover, this research will have cross- disciplinary interaction and collaboration both within this thrust, and between the other thrusts. The goal of this thrust is to obtain a sound science base on coastal and marine organisms and the supporting aquatic habitats associated with off shore wind turbines, using the proposed Hull offshore wind energy facility as a test bed. Such information is critical to ensure the stewardship of healthy and sustainable ecosystems while providing important human and community benefits, and is tightly integrated with the regulatory review process. 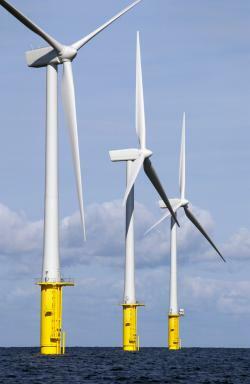 This thrust focuses on three primary issues critical for development and operation of offshore wind energy facilities. These are (1) ecological assessment of the positive and negative impacts of offshore wind facilities on birds and bats, fish and other marine species; (2) development and evaluation of technologies and protocols for monitoring responses of marine organisms to offshore wind facilities; and (3) potential to enhance habitats for marine organisms at offshore wind facilities. Using a unique blend of monitoring equipment, including radar, sonar, and underwater video and audio, combined with at-sea surveys and spatial modeling, we will identify the spatial and temporal patterns of marine organisms and their critical habitats. Understanding the intersection of public acceptance and technological effectiveness is a critical research need for proposed wind farms. There is a complex relationship between designs of facilities the public will accept, and the economic outcomes and technological feasibility of those designs. Costs and benefits are not evenly distributed. As a result, feasible design is an outcome of a negotiated process. To contribute toward better scientific understanding of this process and the boundaries it sets on technical possibilities, the Design for Public Acceptance thrust begins with nuanced qualitative analysis of reasons for public support and opposition to wind farms, utilizes visual and Web 2.0 participatory analysis of design possibilities, and then uses that base of knowledge to develop a multivariate analysis that will be widely helpful in predicting important factors toward siting and design success of future projects. Finally, the most novel contributions of the research agenda are likely to arise from the projects that cut across our thrusts. These potential projects can be gathered under three themes. First, in collaborations between the environmental scientists and the engineers, we will develop and apply new technologies for environmental assessment of the marine environment, and develop new methods for reducing bird/bat collisions at wind farms. Second, in collaborations between environmental and social scientists we will integrate the environmental assessment with public preferences, attitudes and socio- economic concerns. Third, in collaborations between the engineers and the rest of the team, we will develop data and methods for evaluating engineering designs in terms of environmental and social issues.